Immediately beyond Terchová the road passes through an impressing entrance to the valley Vrátna, the canyon of Tiesňavy, with the Vrátňanka brook. It has many rock forms skirting the cascading brook. This National Nature Reserve consists of the proper canyon, the mountain ridge and the adjacent slopes of the Sokolie and Boboty Mts. The Zbojnícky chodník (The Robbers Path) starts in Tiesňavy and leads through the interesting parts of rock landscape. The Vrátna valley forks into the Stará and Nová dolina valleys beyond the Tiesňavy. 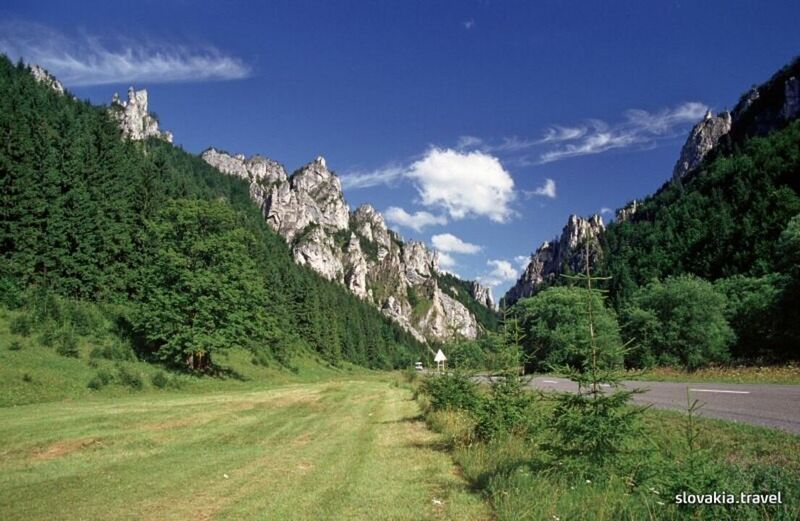 At the head of the Stará dolina valley is the tourist cottage Chata Vrátna. Not far away from the lower station of the chair lift to the saddle Snilovské sedlo is the Symbolic cemetery dedicated to victims of mountains. Hikers also like to stop at the Skok waterfall. The Chata Vrátna cottage serves as the base for trips to the main ridge of the Krivánska Fatra Mts. with its tallest mountain Veľký Kriváň (1,709 m).